Writing proved good therapy yesterday as it lifted my blues and allowed me to pick up the pieces of my day; as soon as the post was published, my husband and I bundled up in our coats and hats. Then we walked west to visit this year’s Mesta Park tour homes. The homes were well-staged. Everywhere I looked I found some little treasure, some little historical detail that had survived who know’s how many owners to share their hundred year old story. And of course, the homes were dressed in their holiday finest. But as nice as the homes were, it’s always good to come through my own front door. 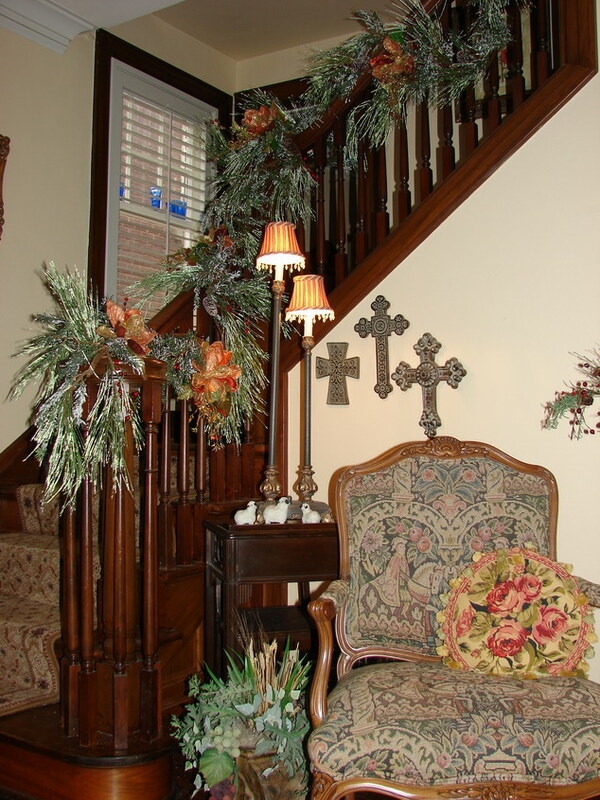 I walk in through the small vestibule to see it all with fresh eyes; immediately, I spot the greenery that covers my banister. Then my eye falls on the unadorned tree. Not quite a “Charlie Brown” Christmas tree, our ten-year old artificial tree is small in stature. Four feet from top to bottom. Most of our ornaments, purchased to dress a nine-foot tree, don’t even make it out of the basement anymore. First priority goes to all the decorations made by our children when they were little boys and girls. Any remaining space goes to ornaments that tell stories about our lives — people, places and events. This ornament made by Kara’s six-year old hand always get a choice spot. After all, the little glitter paper star tells the story behind Christmas itself. Love is the star of the Christmas story. From beginning to end, Christmas is about love. God loves Kara. God loves me. God loves you. It boggles our mind that this should be so, for Lord knows, there’s nothing that we can do or say to deserve it. And little Kara is so obviously confused about this message of love. A nice teacher probably wrote the story in big and bold red letters, as teachers everywhere are known to do. But little Kara working in blue highlighter can’t quite get her writing hand around the message. “Kara God loves Kara,” my six-year old child writes. What was Kara trying to say? Was it Kara loves God? Or was she trying to repeat God loves Kara in her own hand, like one who writes a teacher’s words over and over until the lesson sticks. Or is it that God’s love begins and ends with Kara? And me? And you? Whichever it is, just like Kara, we stumble and stutter for the right words and actions to express God’s love, only to have it come out all jumbled. Lost in translation. 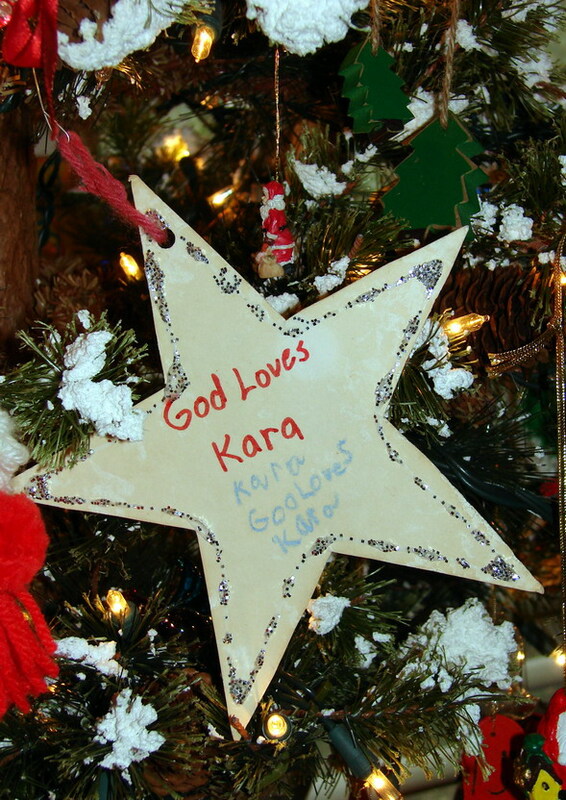 No matter what Kara intended to say, the red pen was right in pronouncing that God loves Kara. And had we been in that classroom, we would have made stars that told the story that God loves you and I. This is the ancient love story that was handed down to me and was handed down to whoever my storyteller was… and so on, all the way back to St. John himself, who doesn’t bother with the likes of a nativity story or wise men or shepherds or this bit about there being no room in the inn. And this is John’s Christmas story in a nutshell. John sets his gospel stage with love. And he leaves the rest of the story, and even the story itself, to the likes of us. If I were six, I might tell the story better. So now your Christmas holiday is complete; seeing a child’s take on the Christmas story keeps the “reason for the season” all fresh and bright and shiny. Since to their eyes, it is. Karson’s Christmas pageant is a week from Thursday — and we may miss it — depending upon when we leave and come back from Texas. If we’re lucky, we’ll make it. One never knows what’s going to pop out of Karson’s mouth. Even if she’s given no lines to read, she’s a natural at improv, as apparently is Melissa Ead’s daughter. I smiled at your diminuitive tree. Mine’s artificial as well, but it’s a perfect replica of a double-trunked hill country cedar! It’s a real Texas tree, I tell you, and I love it, too. I’m thankful for all four gospels as well. And if I had to make a Sophie’s choice, it’s John’s for me as well. But as I reflect on it, John’s gospel may actually be in the easiest of all to bring to life with symbols for Christmas — a lighted candle in a dark room, for example. And maybe if I can hang on to this thought long enough, perhaps this would be the best way for me to bring the day of Christmas to life — sitting in a dark room with a lighted candle before me. You always keep me thinking. I’ve yet to even think about Christmas decs! I don’t like Christmas much at all and haven’t for many years. We’re staying home this year rather than going to my parents so I really must think about it soon. My daughter is a pagan and doesn’t really celebrate Christmas at all, and I find myself bored with preparations and the exterior things because I can never do them as well as I think they ought to be done. Your house and tree are lovely though and I envy you them. We too put up things herself made as a child. I know you will keep Christmas however and whenever the Spirit leads you. I struggle with getting the decorations up as well. And once they are up, I don’t want to take them down. I insist on keeping them up through all twelve days of Christmas, when my husband is ready soon after Dec. 25th. But like a dog with a bone, I hang on to the decoration through Epiphany. Only then can they be taken down. When I was younger, just entering my twenties, my plan was to wait until December 24th to put up the Christmas tree. Maybe years of working in retail gave me some appreciation for the need to wait, though I’m not really certain of the genesis of this longing. In my first year of married life, when I was able to decide when and how to decorate, my husband and I went out to the Christmas tree lot on a cold blustery Dec. 23rd evening, and much to my surprise, there were very few trees left. And I think I let the dream of waiting on Christmas slip through my fingers. Until reading your note, I haven’t thought much about waiting to decorate since; though with an artificial tree, there’s no longer a cost to waiting. Let me know how the rest of your story goes — either here or by post. Cute. Very cute question. And I think St. John is smiling down on you this very moment for asking it. But as to your former question — you will have to ponder that answer out for yourself. But to answer your question for myself… I would call it a holy moment should any blog post end up igniting questions like yours to stir me from slumber in the middle of the night. And whether the moment comes by blog-os or log-os, it’s a holy word, a light shinning out of darkness to turn heart and minds toward God. And here’s another one for tonight’s slumbers. Okay then. I admire firm stands, even on what can become slippery slopes. And here I speak of my time on blogs rather than yours, dear friend.